Esquimalt Harbour is a sheltered harbour in Greater Victoria on the southern tip of Vancouver Island in British Columbia, Canada. The Harbour is bounded by the small cities and towns of Colwood to the west, View Royal to the north, and Esquimalt to the east. The entrance to Esquimalt Harbour is from the south off the Strait of Juan de Fuca through a narrow channel known as Royal Roads. The entrance is marked by the historic Fisgard Lighthouse on the Harbour's west shore in Colwood. Esquimalt Harbour is home to the Canadian Forces Maritime Forces Pacific, based at CFB Esquimalt. It was the home of the Esquimalt Royal Navy Dockyard from 1842 to 1905. Just to the east of Esquimalt Harbour lies Victoria Harbour. In the summer of 1790 Manuel Quimper, Gonzalo López de Haro, and Juan Carrasco aboard the Princesa Real explored the Strait of Juan de Fuca where they claimed Esquimalt Harbour for Spain, naming it Puerto de Córdova. ^ "Canadian Navy: MARPAC - Maritime Forces Pacific - Esquimalt Harbour". Retrieved 2010-02-18. "Tides, Currents, and Water Levels: Esquimalt (Station #7110)". Canadian Hydrographic Service. Retrieved 2010-02-18. 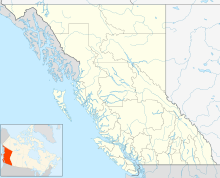 This article about a location on the Coast of British Columbia, Canada is a stub. You can help Wikipedia by expanding it. This page was last edited on 20 April 2019, at 02:37 (UTC).